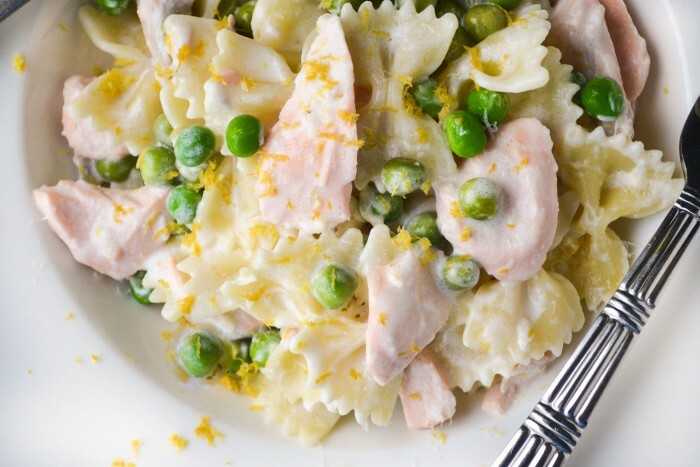 This Farfalle with Salmon, Lemon, and Peas is a deliciously easy pasta recipe with chunks of tender salmon, and garden peas in a to-die-for creamy lemon sauce! This quick weeknight dinner is an old family favorite, I’m not sure why I’ve never posted it here before. The dinner comes together in the time it takes the pasta to cook, and the flavor is wonderfully lemony. I love salmon, and this is one way to make a half a pound stretch to feed four. 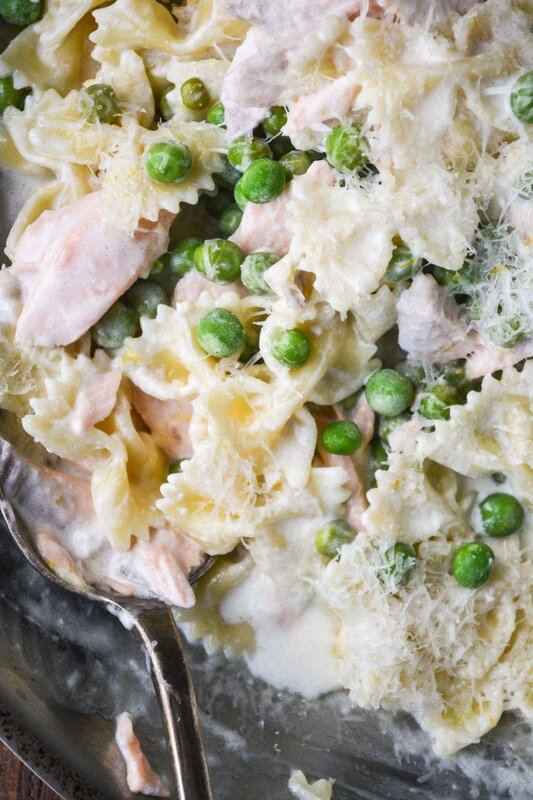 The ingredient list is short: farfalle (or bow tie pasta,) salmon, frozen peas, cream, lemon, and a dash of Parmesan cheese. A little salt and pepper is all you need to finish off a wonderful family meal that is hearty but manages to be light and bright at the same time. You can thank the fresh lemon juice and zest for that. This is a homey meal that has a restaurant ‘feel’ to it. I think it’s the heavy cream that’s responsible, which also means that this is not low calorie dish. But the cream does so many good things for this pasta, I think, once you taste it, you’ll agree the calories are worth it. For one thing the cream allows you to add as much lemon as you need to get great lemony flavor. With anything short of heavy cream, the sauce would curdle with the addition of the acidic citrus juice. 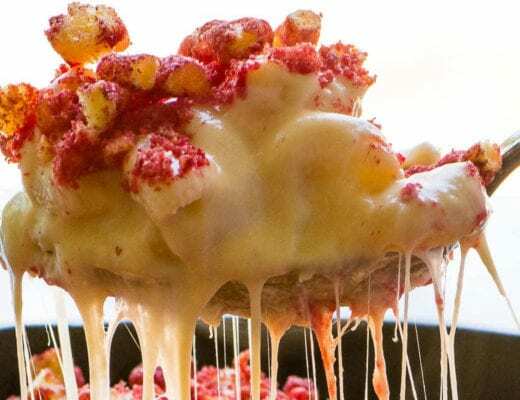 This is also a kid pleaser and a great way to introduce fish to picky eaters…my girls grew up loving ‘pink fish’, and this has been one of their most requested meals over the years. You can use leftover cooked salmon, but I usually buy a small piece and poach it especially for this dish. I put the fish in a saucepan and add water, almost to cover. I bring it to a boil, then cover tightly and turn off the heat. The salmon cooks to perfection in about 10 minutes. I drain it, remove any skin, and gently break it apart with clean hands. The fish flakes naturally into large pieces which retain their integrity in the sauce. You want to be able to see and taste that beautiful salmon, so don’t break it up too much. 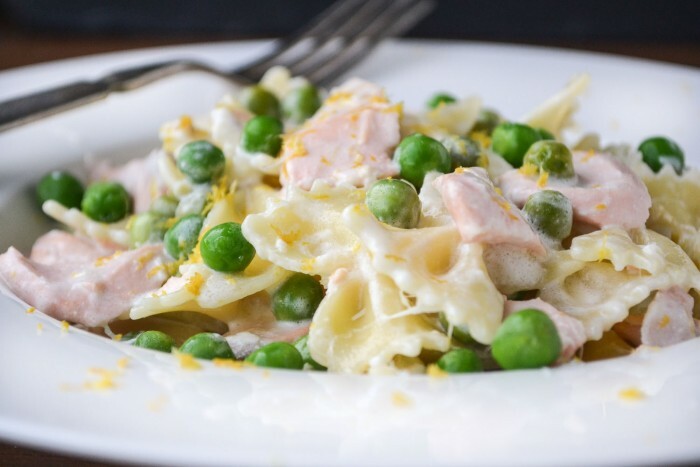 Farfalle is the perfect pasta shape for this, it retains a bite, and the lemony cream sauce nestles in the crevices of the bow. I think pasta shapes like this are so much better for creamy sauces, everything just mixes together better and doesn’t clump like strand pasta can. If your salmon is not cooked, place it in a saucepan and almost cover with cold water. Bring to a boil, then cover tightly and remove from the heat. Let it poach for 10 minutes. Drain and remove the skin, then gently pull the fish into large flakes with clean hands. Set aside. Cook the pasta to just al dente. I usually cook it a couple of minutes LESS than the package tells me to, this way the pasta retains some bite. Drain. While the pasta is cooking, heat the cream in a large saute pan. Add the frozen peas, the flaked salmon, the lemon juice, zest, and the salt and pepper to taste and heat everything through. Add the cooked pasta and a good sprinkle of Parmesan cheese. Mix everything well and make sure the sauce is good and hot. Take the time to give it a taste, and adjust the salt and pepper, and maybe add more lemon or cheese if it needs it. Serve with extra cheese. Use any pasta shape you like for this recipe, I like it with linguine or angel hair, too. You can substitute shrimp for the salmon. 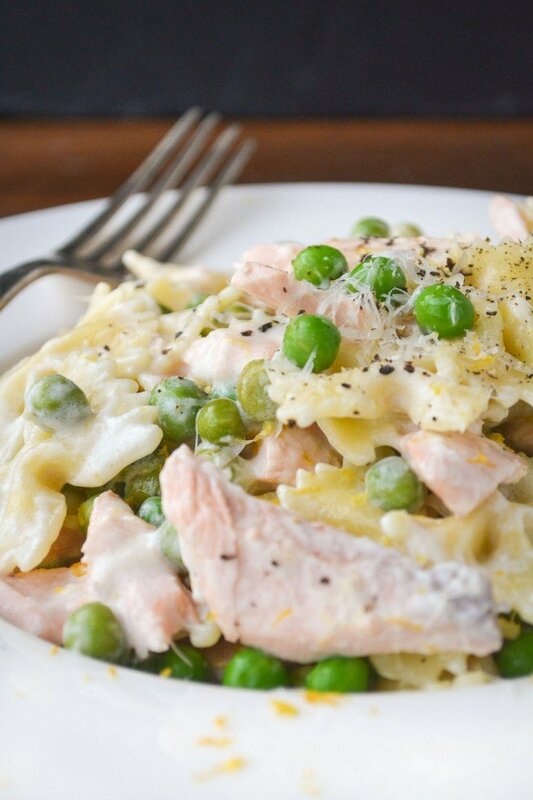 Don’t forget to pin this Easy Farfalle with Salmon, Lemon, and Peas! Hi Sue…Thanks! This is so good and so fast to make. I had left over Salmon and found this recipe. The one item I didn’t have on hand was the heavy cream (and I knew even half and half would curdle) so it was off to the store. The 4 servings with 1/3 cup of heavy cream comes up to 1 tbsp of cream per serving (to me no big deal). This is a keeper and will work well with left over chicken. i used noodles and took your advice of cooking them 2 minuets less than the instructions. Thanks again, Chet PS: I plan on trying your other recipes. Sue, Thanks for this great recipe! It has been on my wish list for a while. Tonight, I cut the recipe in half (except for that delicious sauce). Perfect! Enough for tonight and tomorrow, too. I can’t thank you enough for all the wonderful, taste-tempting work you do. This was absolutely glorious!!! Delicious to eat and beautiful to look at!! Sour cream is harder to work with, Shefali, since it can curdle, but you can certainly try. I would avoid high heat, for sure. I was thinking I might be able to use Condensed Non-Fat Milk instead of cream to make it healthy as well as yummy. Has anyone tried that? That’s such an interesting thought, I bet it would work, as long as there wasn’t a ‘canned’ flavor…but the lemon would probably mask that. I made this for dinner tonight using others recommendations.It is Fantastic.I even posted the pics on Fb as I made it. I did use the mini pasta insted b of the large. It gave me a great smount b of sauce to cart the pasta with. This is a keeper.!!!! Yay, I’m so glad, I’ll go see if I can find your pics! Don’t know what I did but I seem to be the only one who couldn’t make it right! The cream curdled as soon as I put the lemon in. I threw away the first batch and tried again. Curdled again. Cream should not curdle when you add lemon, Renee, I’m confused. Is it possible the cream was past it’s fresh date? And was it regular cream, not half and half? try lower heat, mine curdled the first time (still taste okay, just looks ugly) and was delicious next time made on low heat. Hope it helps! Really wonderful and easy dish. I’m making it again tonight for the second time. Wouldn’t change a thing! Thanks! Can’t wait to try more of your recipes! made it! But, just slapped it together without measuring anything. Came out great! Will add this to list of keepers. I just made this with leftover grilled salmon, and it was delicious. However, I found that I had to use much more than the 1/3 cup liquid as published. I was using half and half, and just kept on adding more and more (I didn’t measure). I usually dislike leftover salmon, but I will most certainly use this recipe again. There is always a little leeway in recopies to allow for variation for whatever reason, I’m glad you liked this Cory. I just made this! Just finished eating it about 5 minutes ago and had to leave a comment on how delightful it was. Creamy, yet light. Poached the salmon per the instructions. Only thing I left out was the zest. Either because I don’t have a zester or because I’m too lazy and just used bottled lemon juice…take your pick. Very good, though! I’ll be making again. Thanks so much for the feedback Tammy — I’m interested that you used half and half, I would love to do that, but I was afraid that the lemon would curdle it, so I guess I’m going to try it that way next time! This sounds great. How many people do you think it serves as a main course – assuming there is also a salad? I have to make a light lunch for 50 people – don’t want it to be too expensive – and thought this would work. 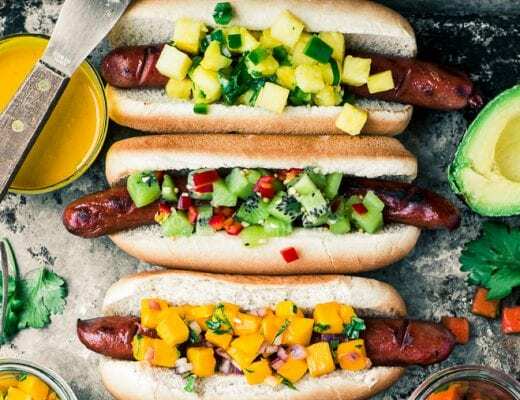 Is it ok to serve an hour later room temperature? Or does the cream sauce get thick and yucky at room temp? thanks! As the recipe is written, it would serve about four, I just added that to the post, thanks, Louise. I allow about 1/8 lb of salmon per person. Not sure about the room temperature…if you could have it in chafing dishes that might be better, but as long as you don’t refrigerate the pasta, the sauce should be ok for an hour. Anyone tried this with plain unsweetened almond milk in place of heavy cream? I am so partial to farfalle. I think those bow ties just taste better because they are so cute. Love this dish, Sue! 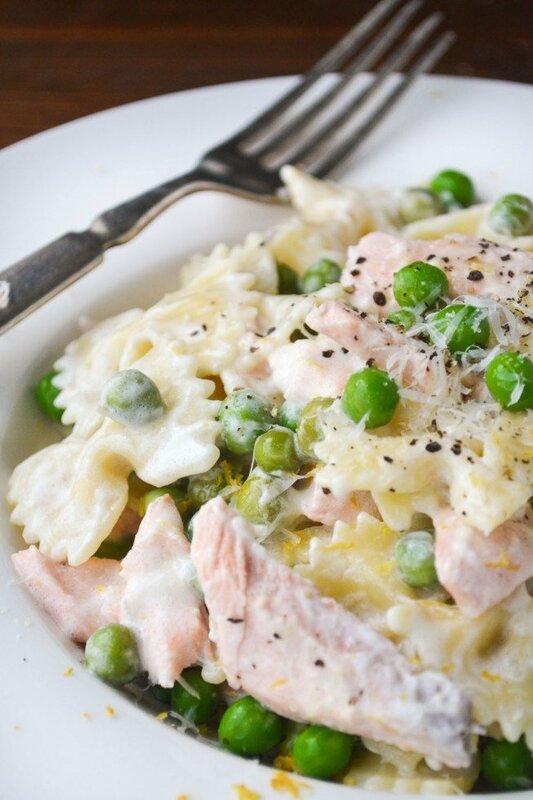 Lemon, salmon, peas and cream. One just can’t go wrong! I love this dish! I make something really similar, but never thought to use lemon. I will, though. :-) Thanks for this. 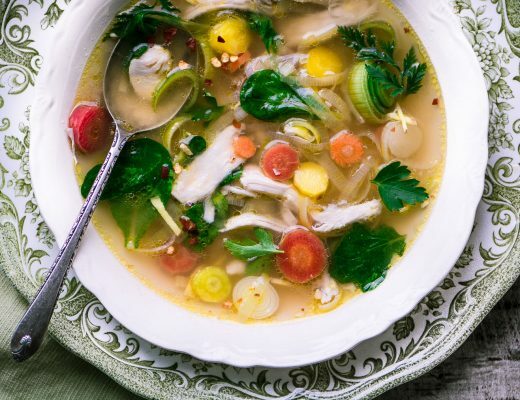 I love these light and bright flavors, the perfect meal to enliven a cold January day! what a wonderful light and flavorful dish. The green peas add a nice touch of color and I love that sauce. Creamy pasta is one indulgence worth the calories. 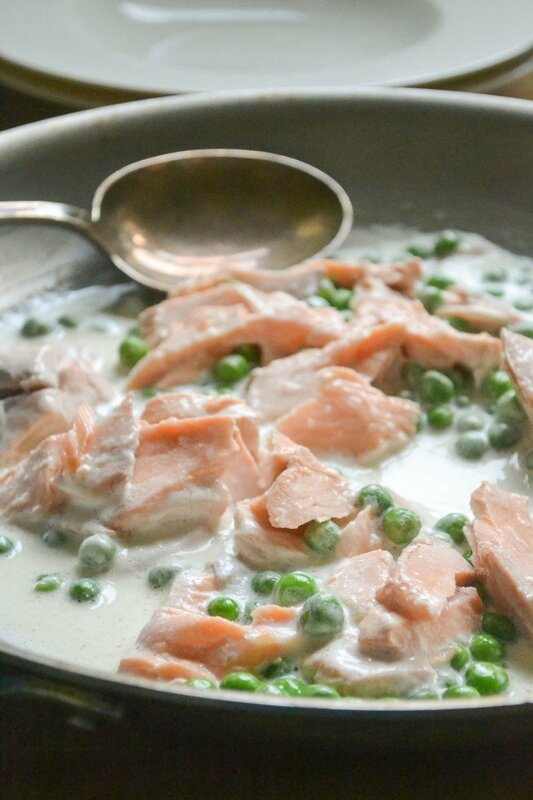 Plus, I figure the salmon and peas infuse it with so much health, they pretty much cancel each other out! I do my boiled eggs that way too! I Have always made it with smoked salmon..I prefer yours. I am going to make this tonight! YUM. This is my kind of healthy comfort treat, Sue.